As Kettering Town get ready to turn their attention to Basford United and the Emirates FA Cup this weekend, they have been able to reflect on a superb start to the Evo-Stik South League Premier campaign. With September done and dusted for the Poppies as far as the league is concerned, they sit on top of the pile after making it eight wins from nine matches with an impressive 3-0 victory over Banbury United at Latimer Park on Tuesday night. For boss Marcus Law, his staff and players, it has been an excellent effort capped with, no doubt, a little bit of relief. 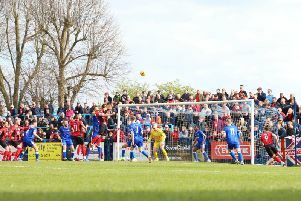 Law came under significant pressure from sections of the Kettering support last season as they could only manage a ninth-placed finish after the club had made it clear that promotion was the expectation. But so far this season, the Poppies have gone about their business quietly and ruthlessly with a 3-1 defeat at Weymouth being the only blot on the copybook at the moment. Law admitted he was pleased the club’s board stuck by him when the going got tough. But he is well aware that there is plenty of work for him and his players to do. “If you break last season down, there were some real bizarre games and moments,” the Poppies boss said. “In the 20-odd years I have been managing, it was quite a unique situation where there were a lot of uncontrollables. “It was described as an awful season last year but even close to the end we still had a chance of being in the play-offs, as much as people were writing it off. “So if that’s classed as a bad, bad season then we aren’t doing too badly. “But I am thankful that the board stuck with me. “From the conversations we had I think they could see what we were trying to do. “I have always said that it takes three years to build a side. “Admittedly, the task was to do that in two years but we are pleased at the moment. “We know we have got a lot of work to do but the challenge for September has been met. “We wanted to be in the play-off places come the end of the month and we wanted to still be in the FA Cup. “But there will be different challenges that will come and October is going to be a huge month. “The league programme looks really tasty and if we are still in the FA Cup then we will have a fortnight of cup football as well. “The success brings a lot of pressure and the squad will need additions along the way. “There’s loads of football to be played.